Elden Auker was an All-American in baseball, basketball and football at Kansas A&M in the 1920’s. Although suffering a shoulder injury while playing football, Auker was still able to become a successful pitcher by creating an underhanded style of pitching, which led to his nickname, “Submariner.” Auker joined the Detroit Tigers in 1933 and pitched in the 1934 World Series against the St. Louis Cardinals, winning one game (although Detroit lost the championship in a seven-game series). Auker also played in the 1935 World Series against the Chicago Cubs. He pitched the first six innings of game three, which Detroit ended up winning in the eleventh, 6-5, leading Detroit to win the series in six games. 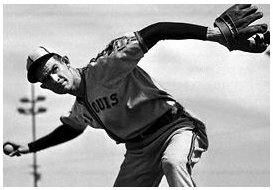 Elden also became the first pitcher to throw in a night game in St. Louis (May 24, 1940). BRC had the privilege to interview Mr. Auker shortly before his passing. Elden shares his thoughts on the Babe as a person and a player. Elden talks about the golf league that he was in with other Major League players, including Babe Ruth. Elden talks about his first time up to pitch in the Major Leagues, which happened to be against Babe Ruth. Elden talks about what he enjoyed most in baseball – the friends he made.